This nut milk has the consistency of low fat milk. If you like a thinner consistency, add more water. If you like it even creamier, add more coconut milk. The long soaking and blending time also contribute to the creamy, full-bodied texture of the milk. If you are doing a smaller nut, such as pistachio, you could probably get away with soaking for less time. Alternatively, if you use brazil nuts, you might want to soak for another six hours. 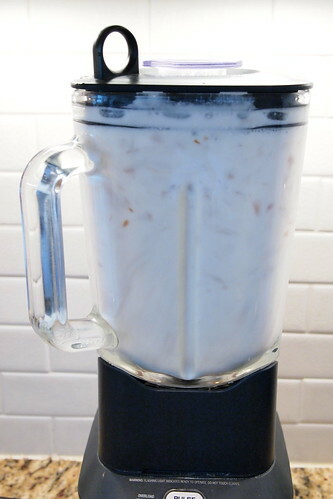 If you like sweetened almond milk, I recommend soaking and blending a PITTED date along with the almonds. You can also add agave or maple syrup. I like the base of coconut milk, but if you don’t have it or dislike it, simply omit. I actually like Trader Joe’s brand of light coconut milk best. 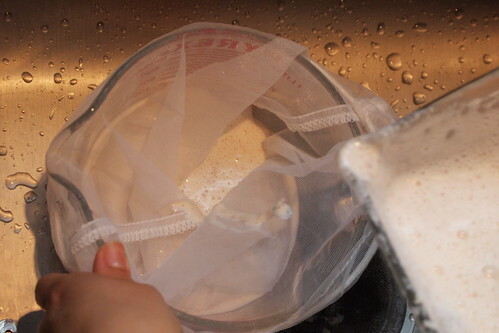 The nut milk bag is a lot less messy and works really well, but a cheesecloth or fine mesh strainer will do the job. 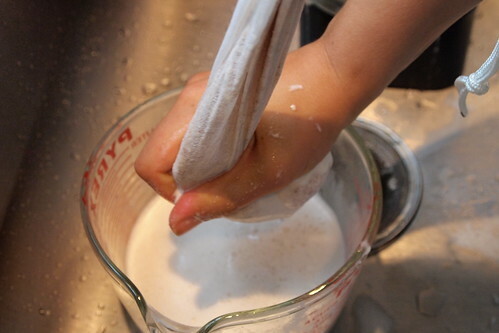 In fact, my first tries involved a strainer and then cheesecloth, but I gave in and got the nut milk bag. It’s easy to find on the Internet, cheap and is perfectly suited for the job 🙂 . I like to keep mine in a glass milk jar so I can shake it up since the milk is not homogenized and will definitely separate. Per gli italiani, ho fatto un pò fatica spiegare gli attrezzi che servono, dunque fatemi sapere se qualcosa non ha senso o se sapete com’è meglio chiamarli! 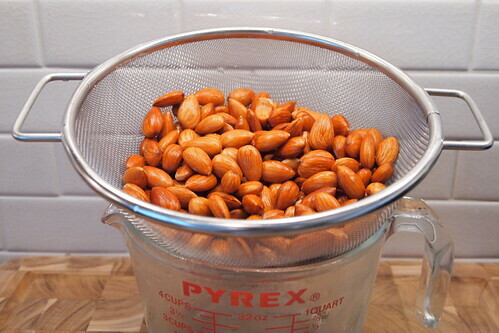 Drain and rinse nuts in a colander and place in blender. Add salt, coconut milk and 2.5 cups water. Blend for three (yes, three) minutes. 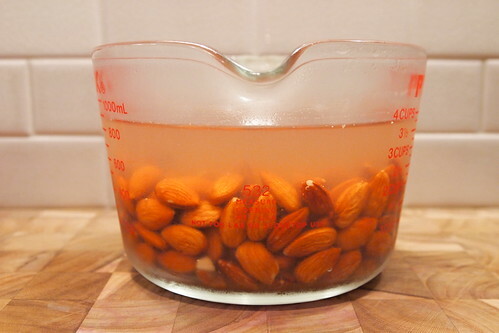 Place nut milk bag over large measuring cup and pour almond mixture into bag. Squeeze pulp until fully wrung (perhaps best to do in two batches). 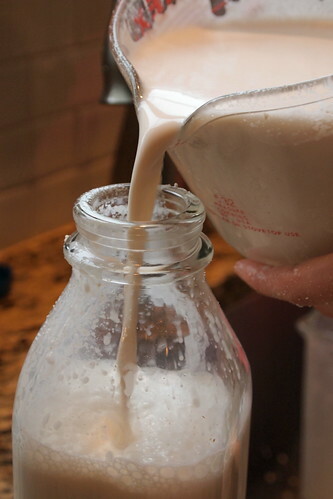 Pour milk into pitcher or glass jar and refrigerate. Lasts about 3-4 days. 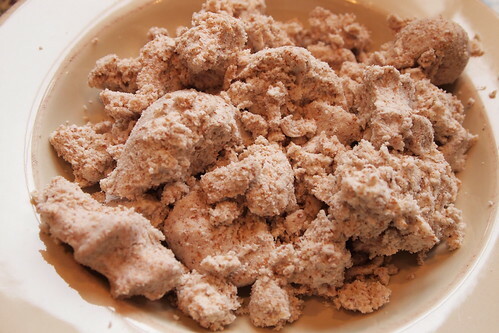 Use pulp for baking or add to oatmeal! Colate e sciacquate bene le mandorle e mettete in frullatore. Aggiungete sale, latte di cocco e 2,5 tazze d’acqua. Frullate per tre (sì, tre) minuti. Mettete la borsa di rete dentro una scodella e versateci la mescolanza. Stringete la borsa finché la poltiglia sia abbastanza secca (è meglio farlo in due lotti). Versate il latte in un broccale o vasetto e mettete in frigo. Dura circa 3 o 4 giorni. Usate la poltiglia per fare dolci salutari o mettete nei cereali caldi!